Send these colorful personalized moving announcements to let friends and family know of your new address. Flat printed in typestyle and ink color as shown. Full back design as shown included. Size 7".. Celebrate the season with our foil stamped Christmas photo cards with a gold foil Cheers! design. Matching blank envelopes are included. Photo cards come with fully printed card back. Size of photo.. 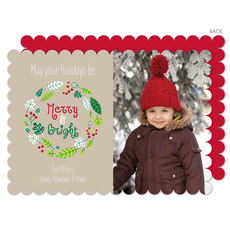 Celebrate the season with our foil stamped Christmas photo cards with a gold foil Merry Christmas Starburst design. Matching blank envelopes are included. Photo cards come with fully printed card.. Celebrate the season with our foil stamped holiday photo cards. Matching blank envelopes are included. Photo cards come with a fully printed card back as shown. Size of photo cards are 7" x.. Celebrate the season with our holiday photo cards. Matching blank envelopes are included. Photo cards come with a fully designed card back as shown. Size of photo cards are 7" x 5". Flat printed in.. Send these personalized photo moving announcements to let friends and family know of your new address and send holiday greetings. Flat printed in typestyle and ink color as shown. Full back design as.. Celebrate the season with our foil stamped holiday photo cards. Matching blank envelopes are included. Photo cards come with a fully designed striped pattern on card back as shown. Size of photo cards.. Celebrate the season with our holiday photo cards. Matching blank envelopes are included. Photo cards come with a fully designed card back as shown. Size of photo cards are 5" x 7". Flat printed in.. Celebrate the season with our Christmas photo cards. Matching blank envelopes are included. Photo cards come with fully printed card back. Size of photo cards are 5.5" x 7.75". You select shape of.. Celebrate the season with our merry and bright holiday photo cards. Matching blank envelopes are included. Photo cards come printed with white Merry & Bright on card back as shown on sample. Size of.. Celebrate the season with our foil stamped Christmas photo cards. Matching blank envelopes are included. Photo cards come with a fully printed card back as shown. 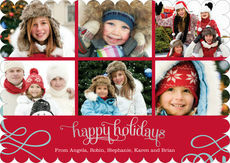 Size of photo cards are 7" x..
Our exclusive Park Place collection combines a simply modern look with seasonal designs. 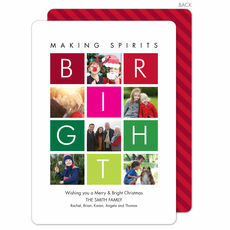 These stylish Christmas cards feature bright colors and on trend looks. 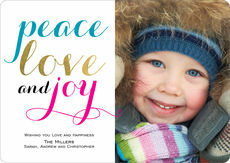 Designed for a merry and joyful impression, you will be proud to send these cards to your family and friends. 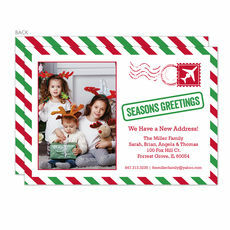 If you are moving soon or recently moved, consider sending a holiday card which combines a stylish moving announcement! Your friends and family will love to have your contact information printed out so they can easily access it! We also offer many styles that feature foil accents, which is so popular and perfect for the season. Add some shimmer to your holiday cards with our gorgeous on-trend foil accents which come in many colors including gold, silver, rose gold and more. From large fun sentiments in the foil color of your choice to confetti dots and frames, your cards will provide the ideal seasonal accent. Make your Christmas season perfect this year with your own merry and bright joy.